The smallest thrush indigenous to the western Palearctic, the purple thrush is easily distinguished from the others by its eyebrow and its pale beige half-collar and its flanks and the feathers under red winglets. This distinctive criterion is very well observed in flight. It measures 21cm and has an average span of 33-34.5cm. Both sexes are identical. There are slight geographical variations and in particular two “subspecies or breeds”: Ticoburni (Iceland, Feroes Islands); a little larger than Tiiliacus (northern Scotland, Scandinavia and northern Russia to eastern Siberia, Lake Baikal, not further south than Poland and southern Ukraine). Of the 4 species of huntable thrush in Europe, the purple thrush is the one with the northernmost distribution. Both breeds have slight color differences: Ticoburni is a little darker. The weight varies according to the season and the geographical localities occupied by the “subspecies or races”: Tiiliacus : autumn: 68.4g;summer: male: 62-74g: female: 71-73g; Spring: male: 58-68g, female: 52-77g. Ticoburni : spring: male: 66-88g; female: 70-74g;September-October: 71g. They are distinguished from other species in particular by their size and in particular the song thrush by its flight rather similar to that of the starling ( Sturnus vulgaris ) and by the underwing of the red wings (boards 24 and c, according to 2) which earned its name in English (redwing) and Spanish (Zorzal Alirrojo). 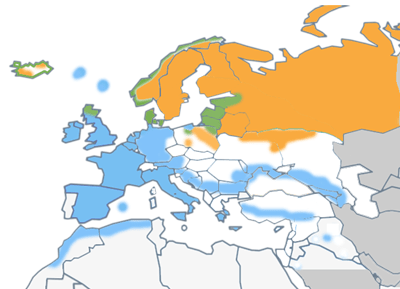 Geographical distribution of “subspecies or races” : Tiiliacus has a discontinuous and variable distribution in numbers from northern Scotland to Scandinavia and northern Russia. Most breeding populations are between 50 ° and 73 ° north latitude. Further south, several partially isolated populations are located in Poland and southern Ukraine and part of the Baltic republics. Ticoburni is present in Iceland, Faroe Islands. This subspecies nested in southern Greenland in 1948 and in 1967. In 1990/1991 a small population settled in southern Greenland. 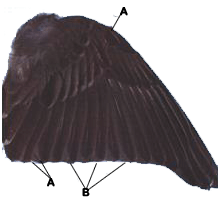 A : Large covers and one or two tertiary feathers with a very pronounced apical and triangular white spot at the tip. B : Extremities of feathers more rounded than in adults. A : Large covers and tertiary remiges have a more uniform color and a more discreet, semi-circular, but not triangular, white spot. B : Extremities of the feathers less rounded and faded than in the young. Common or even locally abundant species that nests in several types of wood: coniferous, Arctic birch, locally in parks and gardens in Iceland and Scandinavia, hedges with tall trees. In Russia it breeds near open areas of large forests (burned areas, logging), tundra and taiga. In Scotland, individuals who have recently colonized this part of the range, nest on the ground in large estates, hedgerows and in a variety of habitats with alternating open habitats in the vicinity of the canopy. In migration it frequents mostly open environments but also on the edge of forests, in parks and gardens especially in very cold weather. In winter it uses cultivated areas, large pastures lined with wood and hedges. In Belgium, during severe winters it was possible to notice high concentrations on the coast without observing a high mortality for cold waves not exceeding one week.In Morocco, during the winter, groups of several hundred birds are observed in the orchards of the High Atlas, in the olive groves of the High Plateaux and in the cedar groves. Although probably the least resistant of the Western Palearctic thrushes, which are subject to massive mortality, the Thrush, maintains high populations thanks to its strong capacity to occupy vacant ecological niches, both north and south annual range, and use a variety of food and travel to find it. It consumes a great variety of invertebrates, molluscs whose shell it breaks with its beak or on a rock like the thrush musician. She also looks for food in the litter as well as in cattle droppings: ants, myriapods, worms, spiders. Along the coast, it is able to consume small crabs and marine worms. It consumes most forest berries (blueberries, juniper, sorbus, ..) and fruits (apples fallen to the ground). In the Mediterranean zone, it consumes olives, grapes and many insects harmful to crops. The diet of nesting young birds consists mainly of earthworms (77-96% in Sweden, 67% in Finland) but also other invertebrates (Diptera, larvae of Lepidoptera). Breeding (laying) starts in mid-May in Iceland and usually not before the end of April. The nesting site is either on the ground (28%), in trees (34%), in stumps (17%), in juniper bushes (13%) and on the ground under a juniper bush (8%) . The species breeds in colonies, sometimes with other species such as the field thrush ( Turdus pilaris ) and the European starling ( Sturnus vulgaris ). Of the 360 ​​nests checked in the same area, 45% were less than 10cm above the ground, 14% between 10-50cm, 23% between 0.5-1m, 13% between 1-2m, 3% between 2-3m and 3% only above 3m. The nest is built by the female with twigs, leaves, moss gathered together with mud. The outer diameter of the nest is 13.5 cm (11.5-16.0), the internal diameter of 8.4cm (6.8-9.5), height of 9.3 cm (7.0-11.0) and the depth of 5.4cm (4.5-6.8). The eggs (next board, according to 3), are sub-elliptical, smooth and slightly bluish with many red speckles. Eggs on average measure 29 x 21 mm and weigh on average 14.9 g in Tiiliacus and 15.5 g in Ticoburni . A recent European synthesis (5) estimates European numbers between 16 and 21 million couples (15 countries concerned). The largest numbers are in Russia (12 to 15 million pairs); Finland (1.5 to 2.5 million pairs), Norway (1 to 1.5 million). Other countries host less than one million couples each. Current trends according to the standards of Bird Life International and IUCN make it possible to classify the species in Category 4: favorable conservation status and secure status in Europe. The species is stable or increasing in 9 of them especially in those sheltering ¾ of the European workforce. Due to climatic changes, the hypothesis of a gradual shift of nesting populations towards southern Europe can be envisaged, but this is an assumption which should be verified by monitoring its breeding range. If we assume an average production of 2 young per pair before migrating, the total numbers would be between 64 and 84 million birds before departure in post-breeding migration. Previous estimates made in the 2000s put the European population at between 20 and 26 million, about one third (6). Mortality rate : In Finland the overall mortality rate has been estimated at 57-58%. The oldest known banded bird was 18 years and 9 months old. The different populations are strict or partial migratory. For example, breeding birds in eastern Siberia travel about 6500 km to reach their wintering areas. The coburni “race” winters in Scotland, Ireland, western France and the Iberian Peninsula. The “race” iliacus winters in western Europe, on the Norwegian coast, the south-east of the Baltic, and around the Mediterranean, Black Sea and Mercaspian. The wintering birds in these last three zones come, according to the occasions of rings, in particular of Finland. Post-breeding migration from Sweden and Norway starts at the end of September and ends in mid-November, sometimes in December. Only a small number of birds from Scandinavia winter in Asia Minor, Aegean Sea and Caspian Sea. Young birds from Estonia and Leningrad move south-west and west-south-west to winter from England to Portugal and southern Italy. In the north of Russia, birds begin their migration on average during the first decade of October and reach the Iberian Peninsula in November and sometimes not before January depending on weather conditions. Some studies suggest that Spain and the United Kingdom host nearly 75% of wintering European populations (in 5). According to work from 1981 (in 3), the same migration corridors are used in autumn and spring. 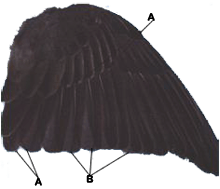 The purple thrush performs its migratory movements at night but also during the day in relatively numerous groups by emitting characteristic contact cries, very useful for identifying the species during the analysis of the magnetic tapes of the bioacoustic stations. In the Mediterranean zone, the purple thrush arrives later (late October-November) than the thrush musician. The bioacoustic stations operating every night and simultaneously in northern Italy (Arosio-Udine) and in the south of France (IMPCF: 6 to 14), show that the first birds in autumn fly over Italy from the mid-October and in the south of France, it is at the end of this month and especially in November that the passages are recorded. In the Iberian Peninsula and in North Africa, the species arrives at the end of November, December and even in January according to the meteorological conditions. The return migration begins in late February and especially in March (3) and continues in early April. These results from the 1970s have been confirmed and refined thanks to bioacoustic stations and daily counts covering the Mediterranean basin (IMPCF: 6 to 14) but also by the study of lipid accumulation in Portugal (4). 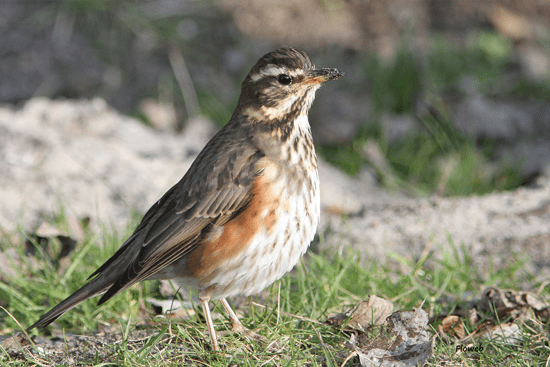 In Norway, thrushes arrive from late March to mid-April in the northern Caucasus in March-April, in the Minsk region in early April, in Russia in the second half of April, and in Urals in the end of April (3 and 18). Two cases are cited in the North American bird recovery literature in 1959 (in 3). The purple thrush is like the thrush musician hunted in the Mediterranean zone. 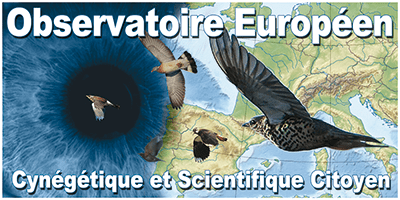 We do not know the share of the samples in France, since the survey ONCFS / UNFDC, concerned all 4 species of thrush hunt. 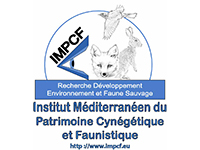 It is the same in other countries concerned by the hunting of this species with the exception of Italy, where the sampling book provides for the distinction of species, unlike that introduced in Greece. 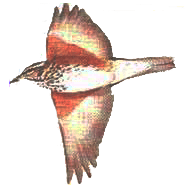 Hunting patterns are similar to those of the Song Thrush, with a predominance of fixed flying fire due to the relatively frequent and daily group movement of this species. It is traditionally caught in the glue from a fixed position (Derogation: Art 9 of the directive 79/409) in the south east of France and in Spain, but contrary to the thrush musician, with the top of the trees where she is used to posing as a group. The status of this species is considered favorable in Europe but its erratic behavior makes its study difficult. The fluctuations observed in Europe (5) result from a lack of knowledge which should be filled in accordance with the recommendations of Directive 79/409. The possible entry of new countries into the European Union will allow us to complete our knowledge, particularly in Eastern Europe. As for all the species hunted, it is essential to have statistics on the samples. The generalization of a logbook would be desirable by taking care to separate the species whose status can evolve independently and to know the number of hunting trips (with or without sampling) to calculate the hunting effort. The conservation of nesting habitats of the purple thrush determines the future of the populations. This species, the most Nordic of the 5 classified game in the genus Turdus, breeds in often difficult weather conditions including even in May and June in the Scandinavian countries and Eastern Europe. The main habitats to be conserved are the northern forests whose phytosanitary treatments are to be monitored, the Arctic birch plant formations and the “taiga and tundra” type habitats. In addition, as with other species of Turdidae, hedgerows remain essential in agricultural areas for breeding. In the wintering area, the protection of habitats useful for staging is essential: high altitude forests (broadleaved and coniferous), high-altitude meadows but also olive groves and vines in the Mediterranean zone such as the juniper heath (Juniperus sp) and orchards providing the species with a rich and varied food. 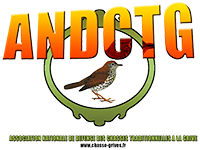 As for the song thrush, the development of olive groves supported by the European Union should be a factor favoring winter and pre-breeding survival.